Brilliant Breakthroughs for the Small Business Owner Book Series 2017 - Brilliant Breakthroughs, Inc.
get into the hands of many Small Business Owners! It’s the 4th Quarter so we have a gift for you! Want 100 Free Tips of Dos and Don’ts from 2018’s Brilliant Practicing ExpertsTM? When you enter your contact information (at the top or bottom of the page), we’ll send you “100 Free Tips for the Small Business Owner” and keep you aware of what’s happening with our authors, who are Brilliant Practicing ExpertsTM, and some other goodies too. Remember to confirm your subscription so we can deliver your 100 Free Tips! Why is this fabulous for every Small Business Owner? We introduced a new conversation into the Small Business Sector about how to win B-I-G at Small Business Success in the 21st century. Additionally we shared what’s happening with the Entrepreneurial Explosion and how the Entrepreneurial Epidemic has a stronghold on the country! Then we introduced the framework or model of The 4 Performance Pillars for Small Business SuccessTM, which are: Productivity, People, Productivity, and Peacefulness. Next, we shared topics of Simplifying Small Business Success, Insights for Sales, Marketing Messages, Personality Branding with a Headshot, Avoiding 3 Common Business Mistakes, Power of Podcasting, Dreams & Goals, Productive Organization, Effective use of Hope, and Gaining Traction throughout the book. Small Business Owners Note: There’s a new way of conducting business to simplify it in this century and we have 10 Brilliant Practicing ExpertsTM sharing their wisdom to help you up your success factor. When you enter your contact information, we’ll send you 100 Free Tips for Small Business Owners Success and keep you aware of what’s happening with our authors, who are Brilliant Practicing ExpertsTM, and some other goodies too. If you are a Small Business Owner, you’re in the right place. This is where you want to be to learn how to win at business in the 21st century! and then sharing it with other Small Business Owners so they can get it in the know too! The Small Business Owner deserves better than what the marketplace is delivering to help them succeed. The 21st century requires Small Business Owners to show up differently to win at business. 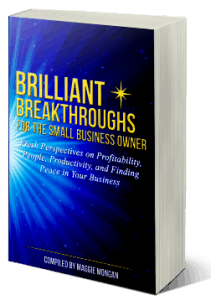 In this life-altering business book, you will learn fresh perspectives on Profitability, People, Productivity, and Peace to dramatically simplify and boost your business performance in one swoop. As successful Small Business Owners and Brilliant Practicing ExpertsTM, our authors understand the power of blending best practices and unconventional techniques to grow a business. We’re sharing our winning formulas to help you determine which activities truly drive profit, how to develop and nurture people as your greatest asset, discover new approaches to become more effective and efficient, and build a peacefully performing business so you can step into your potential. We respect your time and appreciate your trust. No one has time for spam. Thus, we promise to only send valuable and relevant messages. Until we see you on the other side, shine brightly!